Today is election day for all of us in the US. And I am hesitant to write this because the election brings about intense feelings for so many folks. And yet I am compelled to acknowledge this day in the life of our community…and remind us that despite the votes we cast today, we are first and foremost followers of Jesus Christ, who is neither Republican nor Democrat because such divisions are human creations, not God creations. If the election process proceeds normally (though not a given for this election), sometime late tonight or early tomorrow morning, our country will have a new president-elect. Some folks will cheer. Others will mourn. Many, regardless of the outcome, may just shrug their shoulders and sigh with exasperation feeling that the US could (and should) do better in its choices of political leadership. If this election process is evidence of anything, it is how deeply the US is divided. The vitriol has been abundant over the past year. And, frankly, the utter lack of dignity and respect towards people on all sides is disturbing. We have watched as violence has erupted at the hands of persons on every side of this election. We have listened to name-calling. We have observed a complete failure to show common courtesy and decency towards persons who are children of God – whether named Donald Trump or Hillary Clinton. And this lack of respect and dignity has been building for years. I remember observing it as a youth during the Bill Clinton presidency. I remember watching it grow throughout the George W. Bush presidency. And over the past 8 years during the presidency of Barack Obama, our country’s first black president, it has gotten out of control. So that now, the accusations from both sides of our polarized political ideology begin and end with “unfit to be president.” Too often, we villainize someone because of political ideology and in the process fail to give that person the respect that every child of God deserves. The reality is that for far too many of our citizens the person running for office does not really matter. What matters is an individual’s personal ideology and which political party has shaped that ideology. Today, no one appears to be listening to anyone else except those with whom they agree. And this is neither the Christian way nor the way upon which the United States was founded…nor is it a good way forward. Scripture teaches us to be the Body of Christ. And this means that we need one another. Republicans need Democrats. Democrats need Republicans. And both need independents, libertarians and green folks. 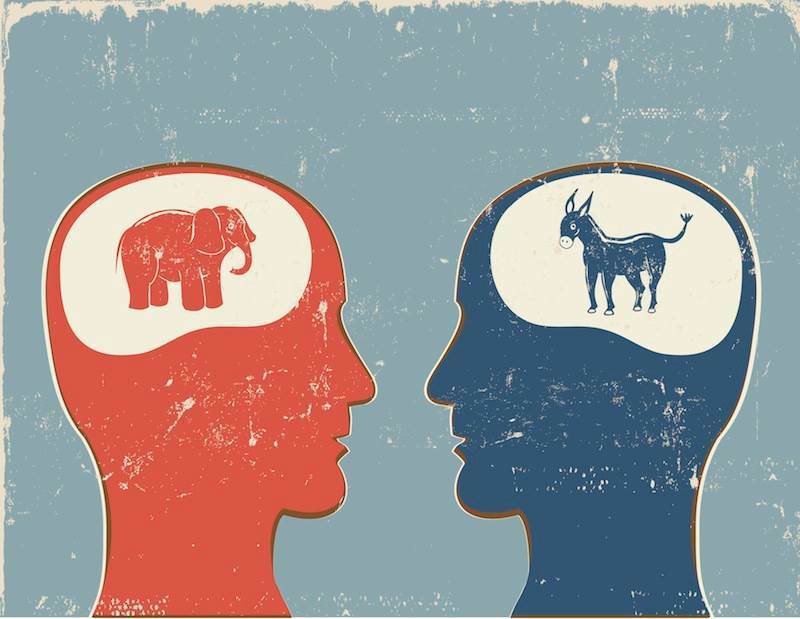 The ideology of each of these political parties is incomplete without the other. Every republican and every democrat has a particular perspective and worldview that is valuable, whether or not you or I agree with them. It is only together that we can have a complete picture of the needs, hopes and dreams of every person in the United States. The demonizing of any particular person from either party or from any perspective is simply not the way of Christ. None of us can see perfectly. None of us can know the depths of every issue and concern around our country. But by working together across ideological divisions we can know more, we can begin to see more clearly, we can mine the depths of our current civil and social ills to devise a common way forward. As disappointed or excited as you or I may be if a particular candidate wins or loses in today’s election, the challenge before us is to move forward by working together. Christ calls us to be His body – a body where no part is inconsequential, where no part is elevated over the others, and where each part is uniquely gifted and called to a particular task that allows the body to function. So, let there be no more name calling, no more demonizing of people who are God’s children, no more vitriol, no more violence, no more division. Instead let there be compassion for the ideas and perspective of Republicans, Democrats, Independents and beyond. Let us learn how to work together. Let us learn to love our neighbor as we love ourselves, most especially when our neighbor is a supporter of a different political party than our own. Let us learn to see the world through more than just our own eyes. Let us become a people where the faith and love of Christ is our way forward.